Exclusive, boutique, high-end apartments in the heart of the fully renewed community of Slabtown. 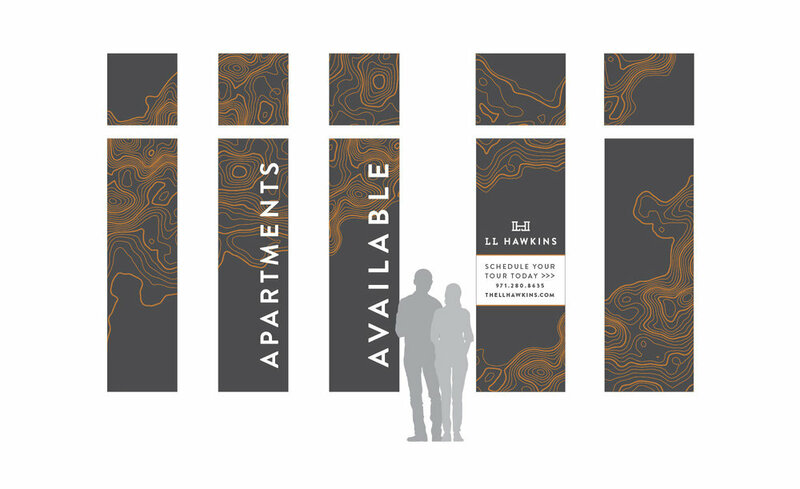 Create an innovative branded graphic installation for the leasing office at LL Hawkins. Leverage the brand to activate the street level presence, attract attention and build awareness. Competing leasing signage from a neighboring building meant that we needed to design vibrant and eye-catching signage to both stand out and blend in. Drawing on the urban wild nature of the brand and LL Hawkin's proximity and access to Forest Park, we designed an installation inspired by trail maps. The final design blends an interpretation of a topographic map with bold leasing information in crystal cut vinyl. An impactful graphic installation that has spurred leasing inquires for LL Hawkins.